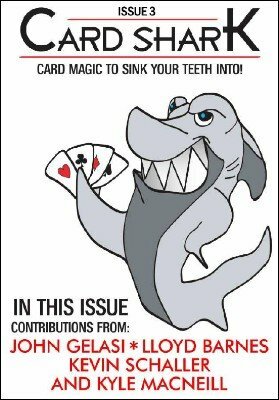 Welcome to issue 3 of Card Shark, the highly anticipated monthly card magazine that contains awesome tricks from magicians around the world. Issue 1 (which is currently on top of the 'Hot list', meaning it is the bestseller in the last three months!) contained 5 tricks, Issue 2 (also in the Hotlist) contained 5 tricks, but this Christmas special contain 8 great tricks from well - known young magicians. Edgy by Kevin Schaller - This could have easily been marketed as a single trick download, it is a very clever and visual prediction effect, where the card visually changes colour, and so does the face. (This first appeared in Kevin Schaller's Ebook and DVD Void). Jazz Club by John Gelasi - A version of Jazz Aces with a very nice twist. Filled with magic and it has a great ending. (This first appeared in John's Ebook: Fit for Kings ). Quadratic 3.0 by John Gelasi - A very clever Fulves - Esque routine, where a largely hands off trick leads to a fantastic surprise ending. A maths trick on steroids. (This first appeared in me and John's Ebook: 2 Can play at that Game ). Elm - Zinser by John Gelasi - Loads of magic with four Kings and a selection, concluding with the classic Hofzinser Ace trick. Clever stuff as always. (This first appeared in me and John's Ebook: 2 Can play at that Game ). Fine Feathered Finks by John Gelasi - I like this one a lot! It is from his new upcoming Ebook Just Cards Vol.1 and it is a fantastic version of John Guasteferro's Homage to Homing. A card flies from packet to pocket with no palming. (This will appear in his upcoming Ebook: Just Cards Vol.1). A Christmas Carol by John Gelasi - A brilliant Christmas themed trick with a kicker ending. This concludes John's awesome submissions to this issue. (This is new). Return of the 'Cycloptic Jacks' by Kyle MacNeill - A version of Harry Lorayne's One Eyed Jack Sandwich, that is a real fooler - even to magicians. (This is new). Barrel Change by Lloyd Barnes - To wrap up this Christmas bananza, we include the complete PDF of Lloyd's beautiful gimmickless change - The Barrel Change. (This appeared in Lloyd Barnes' Ebook: Rebel).